Beautiful Lightweight Fountains Perfect For Your Garden, Patio, and Landscape – Come Take A Look! 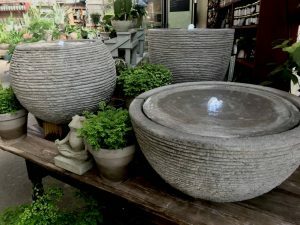 The first shipment of these beautiful fountains sold quickly even though we’d increased our order from the year before. Usually I let these things go, not wanting to push my luck, but a couple of people asked if we could get more of them, so I wrote up an even bigger order and sent it in. Unfortunately for us, they must be popular all over the country because there was a back-up in production and they weren’t scheduled to be shipped until the end of July, well past the busiest part of our season. Their popularity is well deserved. The stone color is so realistic most people who saw the first grouping asked how heavy they were. And, while the water adds weight,they are not difficult to move when empty. The LED light can be used for a very nice effect both day and night, and the sound is pleasant too. The new shipment arrived this week. Perhaps one might be just right for a special anniversary or birthday gift? At any rate, we’re happy to have them in stock to beautify the greenhouse and nursery too. 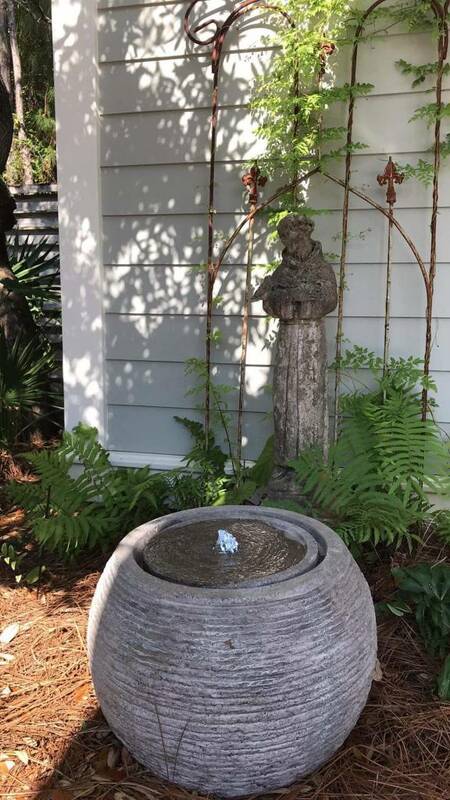 If you’re in the market for a pretty fountain, stop in and take a look! This entry was posted in Fountain, Gifts and tagged lightweight fountains, lightweight stone fountains on August 3, 2018 by Kris Blevons.